In partnership with CheckPoint, we’re participating in Great Games Done Slow, a fundraising event to forward mental health awareness for gamers through games! We join other content creators from all over the world to show how games can be used for positive wellbeing. Great games, no time limit, no pressure. Many thanks to Maki for the wonderful featured image. I wasn’t in the best of places last February. Unemployed, with PTSD over a job I only held for four months I felt completely directionless in life. It was one of those times I like to call a shallow depressive episode. I readily admit that I don’t get severely depressed, but I do occasionally get that hollow sense of existential despair. A sense of hopelessness that comes and goes; when the weight of going on seems a little too big to bear. Games have been a constant refuge for these feelings. And I was looking for one to soothe this particular storm. At the time, I came across a game that people on the ‘Net called “a game for depressed people”. I was piqued, so I checked it out. Night in the Woods is a sidescrolling, platforming, and exploration game, with elements of a visual novel. It features mini-games (like a rhythm game you don’t need to be good at), and an optional game-within-a-game dungeon crawler. Players control Mae Borowski, a red-eyed anthropomorphic cat who is returning home to Possum Springs after dropping out of university. “Home” is a former mining town, now struggling farming town; where she hopes to reconnect with family, and friends from the high school she left behind. After years of being away, Mae finds that Possum Springs has changed. It’s different in some places and has stayed the same in others. To players, there is a feeling of being in the middle of nowhere. This is shown by a backdrop of sprawling forests that look at once peaceful and a little lonely. Despite the chill country vibe though, something strange is going on in Possum Springs and its surrounding woods. Mae’s distinct features are her big red eyes. The game’s cute, stylized characters, soft colors, and wonderful music lends it a lot of that relaxing charm. Big character sprites exist in proportionally big areas; so players don’t get everything in the map all in one look. There are hidden parts game’s area, and players are encouraged to platform vertically to explore. Night in the Woods promises some mystery from the start, though it isn’t in an actual hurry to unfold this to the player. The focus for most of the chapters is on Mae’s relationships: the people she left behind to go to university; her family, neighbors, and her friends. 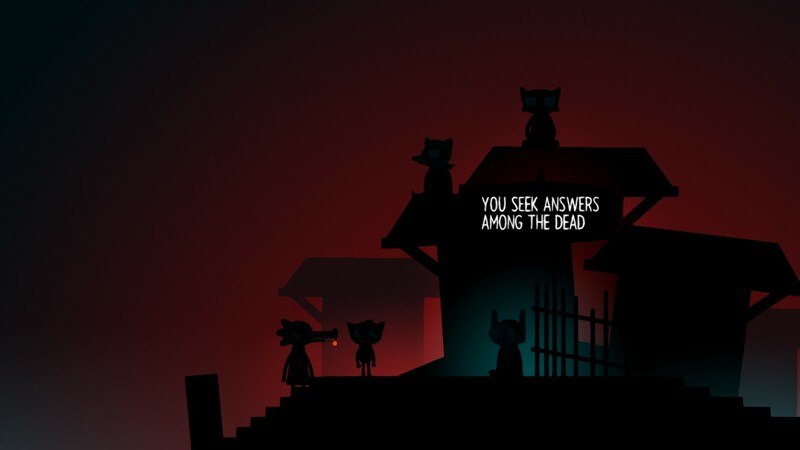 The game advances as Mae spends time with a friend to further the story, but the game set-up itself encourages that take time to poke around. There are many places in Possum Springs to explore, these open up as the player progresses. Mae spills a few details when exploring, and at the end of the day when returning home, players and join Mae at her computer to chat with local friends or to play the-game-within-a-game Demontower. There are a lot of things to do and uncover in the game. You begin at a bus station. Mae waits, but realizes her dad isn’t going to pick her up; so she starts to go home through the forest. There’s a distinct air of dejection surrounding her it’s familiar. She’s just left university and comes back home with nothing to show for it. Mae’s situation felt close to home, and as I played, I wondered how the game would progress with this as the premise. Pushing through, Mae returns to her parents’ house. Her parents are fleshed out characters with distinct personalities. Each morning, Mae and her mom can engage in some pleasant, often cute, but sometimes tense conversation. At night Mae chills with her dad for some television players can also experience. At first these interactions may seem like an attempt to interrogate Mae – they aren’t. Mae’s parents never outright demand answers about her decision to leave for university, though the occasional subtle attempts do come around. It was cathartic in its own way, for Mae’s family to leave her be and let her recover in her own time. Night in the Woods makes it clear her family isn’t just there for decor, and this really fleshed out the entire family life experience. Family conflicts over the state of the Borowskis’ finances and mentions of domestic problems are introduced as time goes on. And while it contributes little to the overarching plot of the game, it shows a part of Mae’s experience and paints a picture of an imperfect family trying to get by, and doing it together. This was a nice way to get players to feel that the game’s “central hub”; a real home for both Mae – and by extension – the players. Videogames usually don’t tend to explore the protagonist and their parents, or attempt to make it more than a perfunctory experience. Night in the Woods makes family feel very much a part of Mae’s life. Family aside, the game does focus a lot on Mae’s relationship with her friends. Off the bat, Mae is immediately absorbed into a band with best friend Gregg, his boyfriend Angus, and the used-to-be-friends Bea. The rhythm game segment is for the songs the band practices. While it can get challenging, there isn’t a game over screen, and the characters just chalk it up to Mae getting rusty with her music skills. When band practice is over, or not everyone can make it, Mae can choose to hang out with her partner-in-crime Gregg, or with the gloomy and cynical Goth Bea. The polarity between the two people Mae can choose to hang out with is a little funny. I chose to focus on Gregg in my first playthrough, because the way he flailed his arms was cute, and I wanted to hang out with the fun and rowdy friend rather than the sad one. The game had other plans though, as both friends’ storylines delve into each character’s personal problems and issues head on. While Gregg and Mae continue to do their “crimes” for the lulz, it’s done so with insight into Gregg’s personal life; his dreams of leaving Possum Springs with Angus, and a brief reminisce on his particularly difficult childhood. Gregg and Mae are two peas in a pod. Their interactions feel like long-time friends pulling each other up and having a good time. Meanwhile, the tension with Bea and Mae is more prominent. Bea is jealous and angry over Mae’s opportunities to carve a life out for herself through university, and the subsequent waste of it when Mae drops out; whereas Bea is stuck managing her family business to make ends meet. They go through an awkward phase of half-friendship. But as Mae hangs out more with Bea, the player witnesses their friendship getting stronger, the two women becoming closer again. 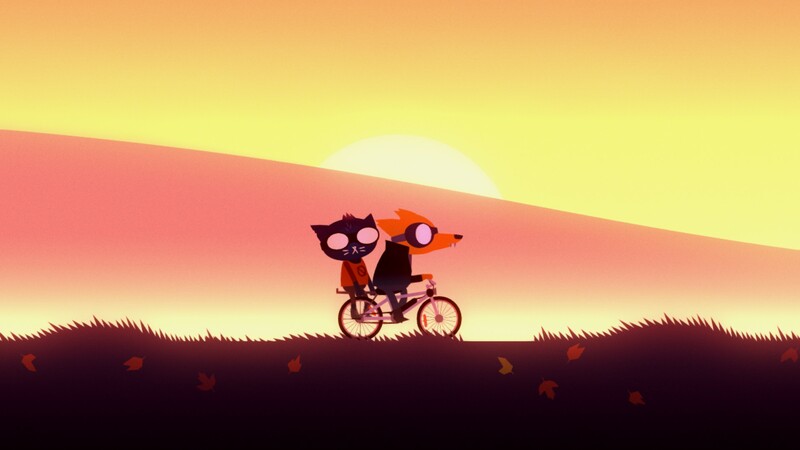 Mae and Gregg, riding a bike through the open fields as the sun goes down. The two friendships are the highlights of the game and they feature a good chunk of it to be enjoyed. Well-written and full of personality, Gregg and Bea feel like a real friends that players would love to get to know and get invested in. These friendships aren’t the entirety of the game though, as Mae can also spend time with the townspeople, giving the sense that everyone is someone in this setting. Mae searches for constellations with Mr. Chazokov, talks to a neighbor sitting out at her porch, asking about her day; and even helps out a boatman as they go through Possum Springs’ dark and unused canal. There’s a sidequest where Mae takes care of some rats in an abandoned building, which features a dubious but funny mini-game, where Mae steals from a pretzel stand to feed them. 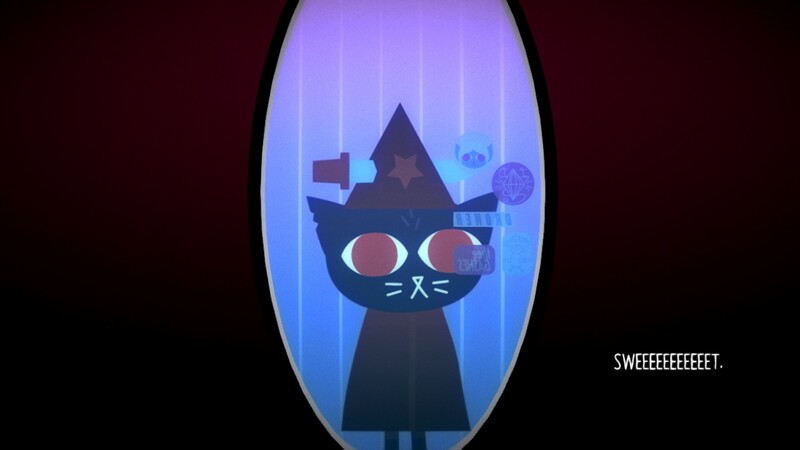 Night in the Woods also finds time to explore Mae’s own issues, as she struggles with a mental disorder on her own. She keeps a journal as therapy. And while it’s fun to see her cute drawings, it’s also feels quite real. Mae still evidently struggles, and it is revealed as the reason why she left university. A number of games tend to forego fleshing out the protagonist, as they are only meant to be the player avatar. But Mae is a distinct character of her own. A fun perspective to see Possum Springs and its inhabitants through. There’s a lot of emotion in Night in the Woods, with a lot of content to uncover; much like being in a treasure hunt. There are creepy moments, sad moments and a lot of hilarious moments. Towards the end, spooky events that concern the town, take front and center. One of my absolute favorites was when Mae and Bea encounter a bunch of teenagers. The kids attempt to stop them from advancing to a part of the cemetery, unless the girls reveal a secret. Mae, in true Mae-fashion, proceeds to tell the story of her notorious prom night. Mae’s tone and the music sell it so well, making this one example of how this game shines. Night in the Woods really knows how to take its players for a ride. The best ones are filled with all sorts of scenic views with the backdrop of catchy beats. It doesn’t have to take you everywhere, but it takes you to enough and gives a complete set of memorable events. It’s like a favorite vacation, a journey with people I can build meaningful relationships with while I go adventuring with them. It can get a little frustrating at times with some tricky platforming, but the challenge isn’t ever insurmountable. The game’s brand of fun is mostly relaxed, even when it gets serious. And while it’s not always wacky fun and games, it’s always relatable, which makes it a perfect antidote for sad days. Night in the Woods is available on Steam. Have you played it? Let us know how you found it in the comments! Non-binary and a writer of many naughty and scary things (sometimes both at the same time). Likes feels-y video games, and anime with the ambiguous label 'psychological'. Pretends to be a 1920's gangster with their dark jazz playlists. Find them on Twitter complaining about something random.